Our manuscript about rWind R package has been recently accepted for publication in Ecography! As you know, rWind is a tool used to download and manage wind data, with some utilities that make easy to include wind information in ecological or evolutionary analyses (or others!). Though there are several examples in the Supporting material of the publication, and others in the vignette included in the CRAN version, here you have a full tutorial with the main utilities of rWind... enjoy! In this example, we will compute wind connectivity of Azores Islands with different points of Europe, Africa and North America during June 2018. I will divide each task of this tutorial in different sections for clarification. In the last version of rWind (1.0.4), we can use lubridate to create a list of dates which will be used latter with wind.dl_2 to download wind time series. The object obtained with wind.dl_2 is an "rWind_series" "list". This object can be easily used with other rWind functions as we'll see later. # that it could take a while, they are 30 datasets and it's a big area. 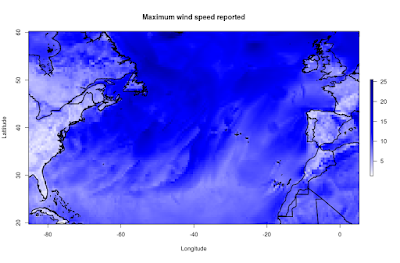 We can use the rWind function called "tidy" to play with the "rWind_series" "list" object to obtain, for example, the maximum speed reported for each cell in the study area during the time series. Since wind data is a vectorial magnitude given in two components (U and V), to compute speed and direction averages we should use both vectors. To make it easier, rWind includes wind.mean function. Notice that wind.mean is specially developed to work with wind.dl_2 outputs, so it will require "rWind_series" object as input. # We can plot a subset of this raster around Azores Islands. 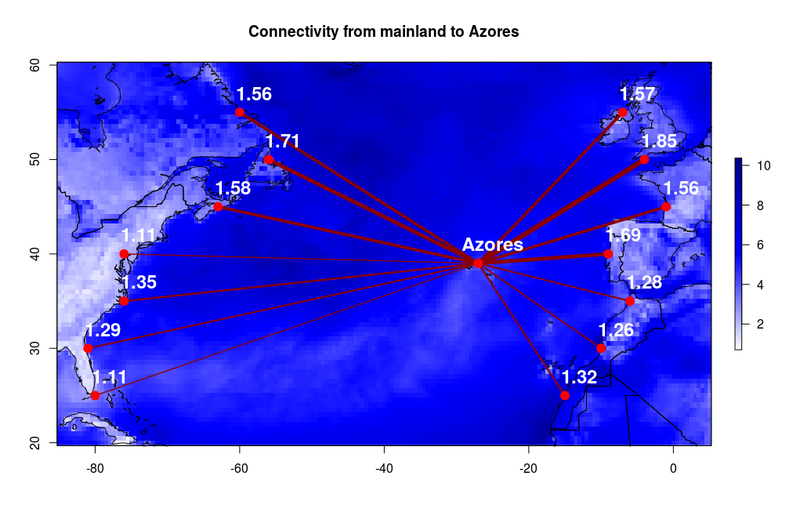 To complete this tutorial, we will use the downloaded wind data to compute wind connectivity between several points in mainland and Azores Archipelago. This kind of measures can be useful in order to establish theories about island colonization by plants or other organisms that could be influenced by wind currents. We will also use this connectivity to compute least cost paths between two locations, in order to virtually plot a wind highway connecting mainland with Azores islands. 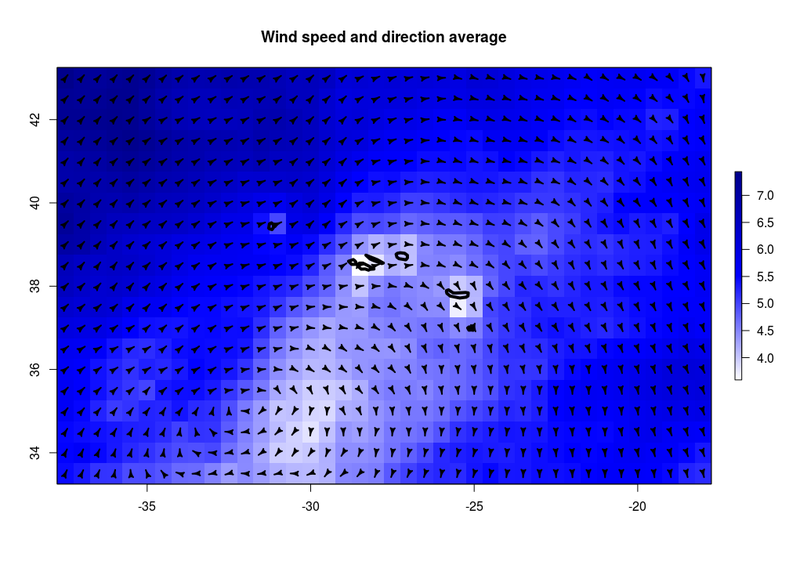 We'll use wind2raster to obtain raster layers of wind direction and speed of each day in the time series. Then, for each day, we'll compute the conductance matrix, a matrix with connectivity values between every single cell of the entire study area. Later, with each conductance matrix, we'll compute the cost between our locations and will store them in a cost_list object. Finally, for each day, if the Cost is not Infinite, we'll get the shortest path between two selected locations, and we'll store it into a “paths” object. # and Azores islands (as an example). Now, we will manage a little bit the results to plot them in a cool way. # multiply connectivity values 1000 times to avoid decimal zeros. # the values to increase the differences between them. 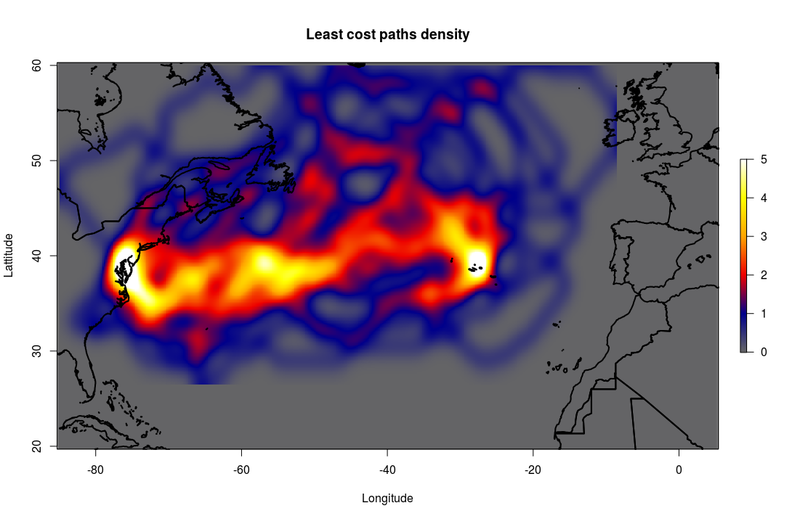 Last but not least, we can use the shortest paths stored for each day to plot a density heatmap. This can help us to visualize wind corridors across our study area (our wind highways!). # paths lines into an psp object. # and convert it into a raster layer that can be plotted. # You can play with sigma value to modify the smoothing. Finally, the ylabel must be latitude instead of lattitude. You are right, sorry about that! It's hard sometimes to fix all the code to be completely reproducible for all users... Feedback is essential!